Don't you love those darker whiskers against the golden orange 'brush' - the flower on the right is very fresh and still has lots of yellow pollen on. In our teeny - weeny front garden this prostrate banksia or Callistemon has been slowly establishing itself for many years ... 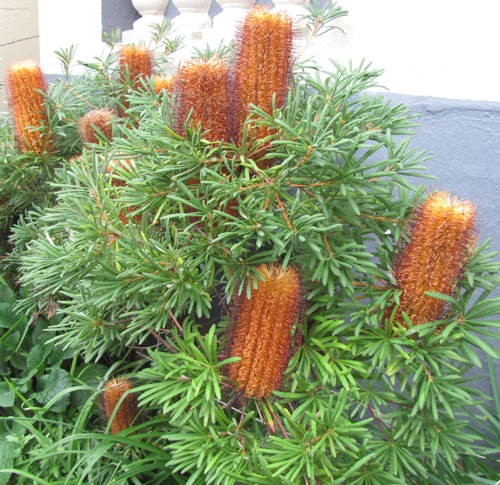 I can't remember when we planted it and I've lost the tag and so I'm not even sure what sort it is, though I think it is a "stumpy gold" which isn't a nice name but is a variant of the "hairpin" banksia or B. spinulosa. I could be wrong though. It is "vertically challenged" and slow growing (at least in our garden!) but this autumn it has flowered magnificently with 15 big and gorgeous 'candles'. It really looks quite wonderful and the birds think so too, those flowers are full of nectar! OOooo, very unusual looking! Is this some sort of evergreen? 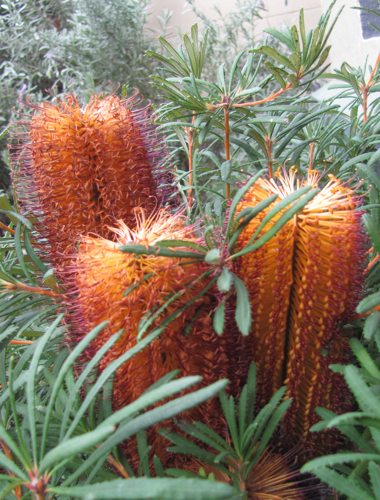 Hi Pandora - Yes, Banksias are Australian native plants and lots of our natives are evergreen. This is a funny old country! Your name for the plant is correct. Banksia spinulosa var. "Stumpy Gold".